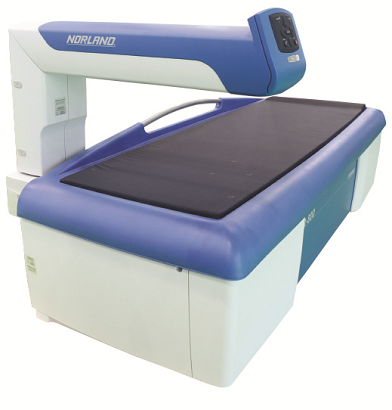 The Model XR-800 from Norland, at Swissray provides the clinical setting the most advanced technology for today’s in vivo assessment of bone mineral density. With a table specified for studies of individuals with a body weight of 202kg within a scan window area of 193cmX67cm this scanner accommodates the largest size range seen in marketplace. Fitted with advanced dynamic filtration technology and a pair of advanced detectors dedicated to independently register high and low energy the Model XR-800 automatically delivers optimized studies that never experience x-ray flux starvation or saturation.Provided with optimized high and low energy count rates the XR-800 delivers swift, precise and accurate studies independent of body size and operator-based analysis. The combined independence from body size and operator-based determinations in scanning and analysis will over time deliver useful clinical studies free of doubt to the clinical community.